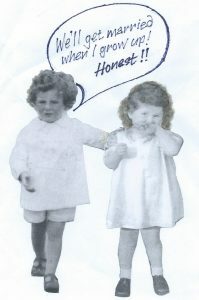 I hope to bring this website up-to-date in due course, but meanwhile, perhaps photos will be my first ‘port of call’. Over many years, our friend, Mike Witt, has taken the trouble to take the many photos at the club for us. However, he is unable to come to the club at the moment, so meanwhile, we hope the many of you who have taken photos would kindly pass them to us please. These photos were taken by Pete Marr and we thank him very much. Hopefully, I shall return to write a few notes about the evening – again in due course. Thanks. 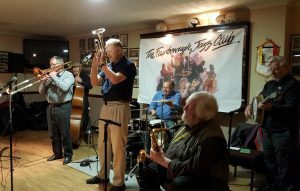 Dave Ware’s Dixie Hotshots play at Farnborough Jazz Club, Kent on 9th February 2018. Dave had an accident, damaging his mouth, so Peter Leonard played trumpet (&vocals). Also Norman Bull is quite illl, so John Finch played trombone (&vocals). The rest were John Lee (reeds), Roger Curphey (double bass), Lynn Saunders (banjo &vocals) and Tony Blackburn (drums). Photo by Pete Marr. 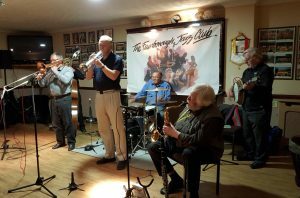 Dave Ware’s Dave Ware’s Dixie Hotshots play at Farnborough Jazz Club, Kent on 9th February 2018. The players were Peter Leonard (trumpet &vocals), John Finch (trombone &vocals), John Lee (reeds), Roger Curphey (double bass), Lynn Saunders (banjo &vocals) and Tony Blackburn (drums). Photo by Pete Mar. Dave Ware’s Dixie Hotshots play at Farnborough Jazz Club, Kent on 9th February 2018. Dave had an accident, damaging his mouth, plus Norman Bull is quite ill, so both were unable to play. 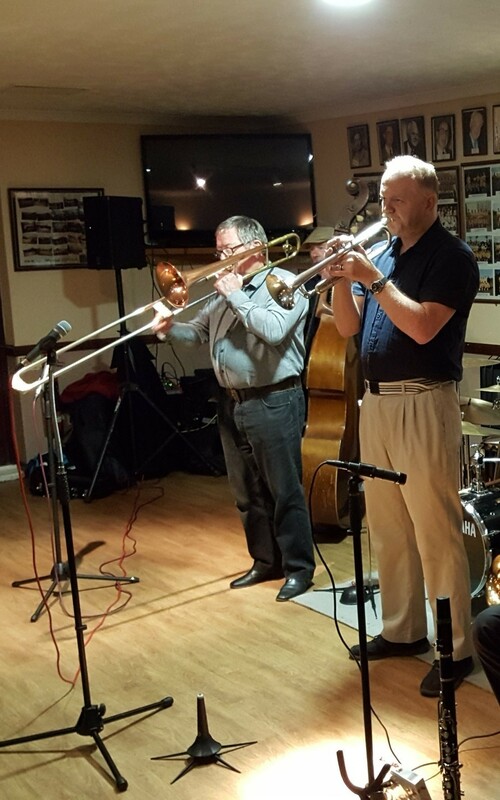 Pictured are Peter Leonard (trumperter &vocals and John Finch (trombonist &vocals) depped for them. The rest were John Lee (reeds), Roger Curphey (double bass), Lynn Saunders (banjo &vocals) and Tony Blackburn (drums). Photo by Pete Marr. 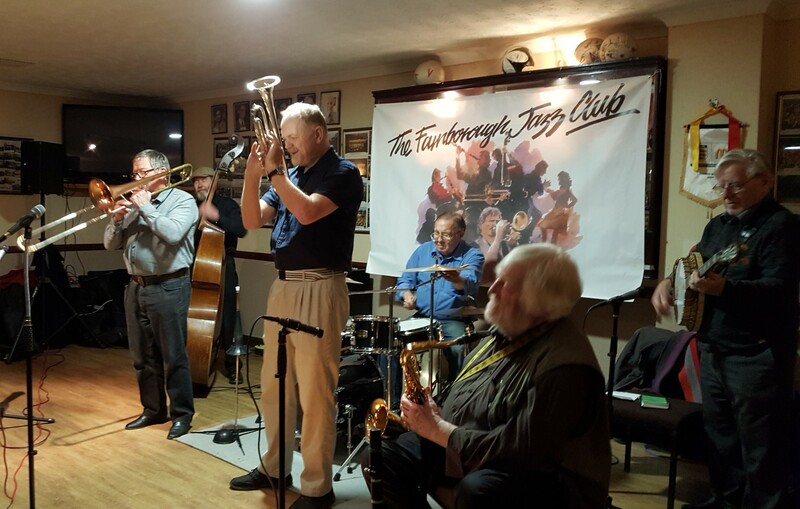 Dave Ware’s Dixie Hotshots play at Farnborough Jazz Club, Kent on 9th February 2018. Photo by Pete Marr. This entry was posted in Dave Ware's Dixie Hotshots on February 12, 2018 by Diane. Hey, guess who is here on FRIDAY 9TH EBRUARY 2018? We have DAVE WARE’S DIXIE HOTSHOTS, but WITHOUT Dave Ware!!!! Seriously, poor ol’ Dave fell over in his garden and smashed his lip. Well it goes without saying, trumpeters do not need to damage their lips, do they! Oh well, bless him, he has replaced himself with a super trumpet player, PETER LEONARD. 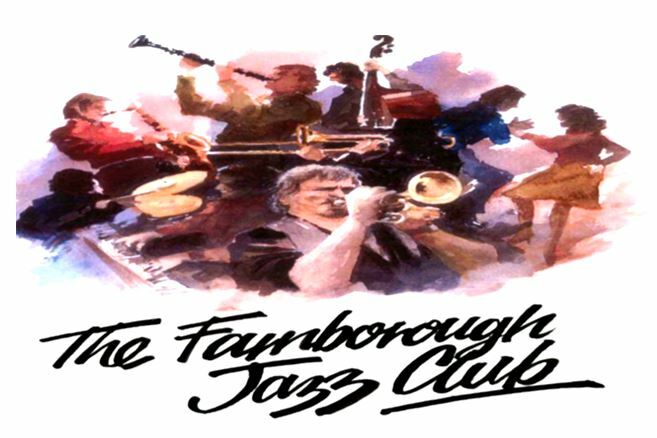 Peter has played here at FARNBOROUGH JAZZ CLUB a few times with other bands (see photo) and we can certainly vouch for him. Anyway, Dave is sending us his usual band, but without Norman Ball too, as he is also under par. So the band is PETER LEONARD (trumpet & vocals), JOHN LEE (saxes), JOHN FINCH (trombone), LYN SAUNDERS (banjo & vocals) ROGER CURPHEY (double bass) and TONY BLACKBURN (drums). 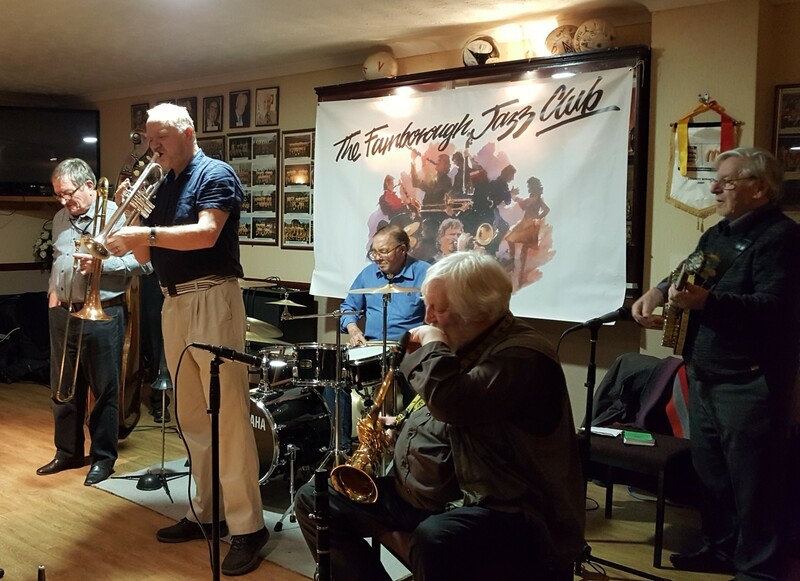 I wont say anymore as Keith and I are being taken out by Jacque and Dave tonight to see The Syd Lawrence Orchestra at Langley Park Social Club and I need to get ready, so see you tomorrow here at Farnborough at 8:00pm. I shall return either late tonight or in the morning with possibly another photo! This entry was posted in Dave Ware's Dixie Hotshots on February 8, 2018 by Diane. Keith, when aged approx 3yrs and Diane, also when aged approx 3yrs. 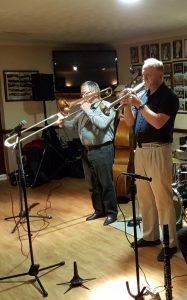 Dave Ware’s Dixie Hotshots, are playing here tonight, 6th October 2017. 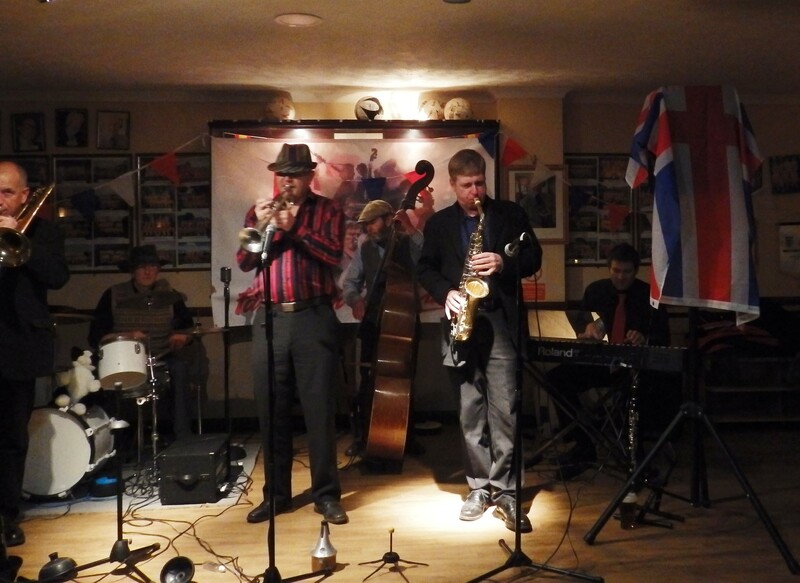 That is here at Farnborough Jazz Club, Kent. Roger Curphey on double bass and Tony Blackburn on drums. Sorry to be so late and so short on info – Keith and I are getting married this week. so running tight for time. This entry was posted in Dave Ware's Dixie Hotshots on October 6, 2017 by Diane.